Deciding on physician compensation ("income division") reportedly splits up more groups than any other issue. Greater diversity within medical practices, the proliferation of subspecialists, the unpredictability of reimbursements from payer to payer complicate and confound many compensation arrangements. How well does your formula satisfy your group constituents? Have you thought about why you compensate the way you do? Do you understand which behaviors you encourage? Are you aware of the pitfalls of your chosen approach? A new analysis by consultant, Geoffrey T. Anders, JD, CPA, CHBC, evaluates multitude compensation approaches, their pros and cons. Compensation systems from productivity driven formulas to cost accounting to resource driven approaches are evaluated for applicability to a range of group practice environments. Anders addresses the best theoretic and practical structure for the compensation program, then layers on the practical aspects that make compensation systems workable. Finally, the "bells and whistles" of management compensation, under-producers, part-timers and other hard to solve problems that are often overlooked get full treatment. 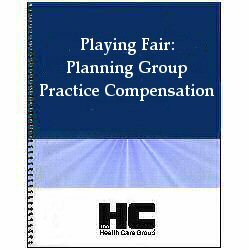 Playing Fair: Planning Group Practice Compensation is a must read and valuable ongoing resource for the group searching for a compensation approach that works, for the consultant who advises on group practice arrangements, as well as the group that thinks it has all the answers.